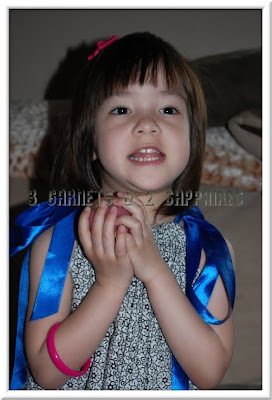 Now that my daughter is 3yrs old, I've noticed her interest growing regarding "pretty" things. 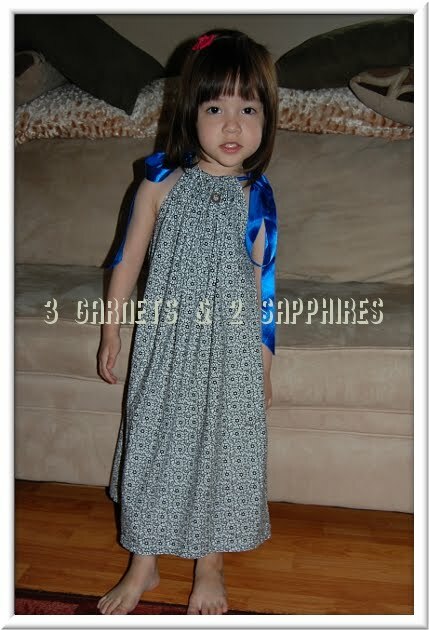 I have been eyeing pillowcase dresses for awhile, but was worried that they would impede her mobility when she was younger. 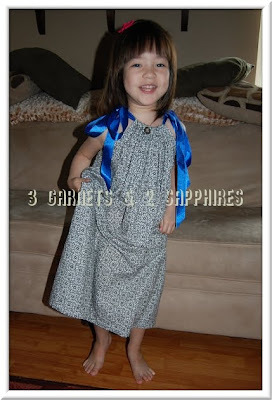 This adorable pillowcase dress in a size 4T was created by Jennifer's Jumpers. I think that we could have gotten away with a 3T, but I like the idea that this dress is so versatile that it fits her now and will probably still fit her in a year or two (or maybe even three). Most of Jennifer's Jumpers are 22 inches wide and the difference between sizes is just the length. I love the black and white fabric choice because it can be used with any color ribbon really. It is extremely easy to replace the ribbon for a different look. I very much like the extra wide ribbon used here, so I will definitely look for something similar should I ever decide to replace the ribbon. Not only are these dresses comfortable, they are also easy to care for. We machine washed our dress in cold water (ribbon included) and then hung it up to dry on a hanger with the top gathered. This worked out perfectly for us. The dress did not wrinkle at all and the top gathered nicely. Jennifer's Jumpers also offers doll pillowcase dresses. I would love to see sets of matching dresses for girls and their dolls added to this boutique's product selection. What a great gift that would make for Christmas or a birthday! Visit the Jennifer's Jumpers online store to learn more about pillowcase dresses and to view their full line of modern and vintage pillowcase dresses. You can also sign up to receive news and promotions via email, as well as follow JennifersJumpers on Twitter. 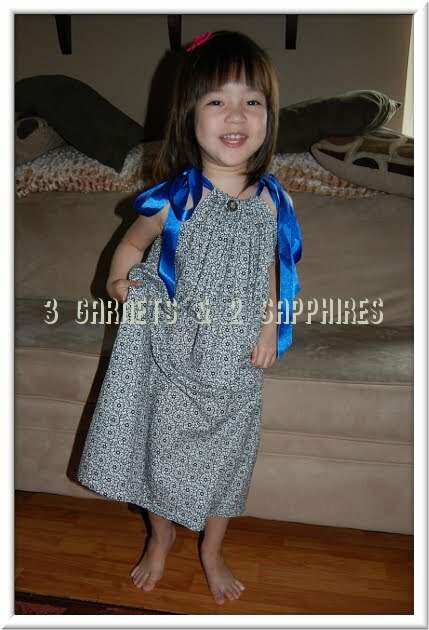 Look for Jennifer's Jumpers pillowcase dresses locally if you are located in Louisiana. Thank you to Jennifer's Jumpers for sending us a sample dress free of charge to base this review upon.